Almost all motion control uses just 2 signals: Step and Direction although a 3rd Enable line is often used as well. Each pulse on the Step line tells the motor to move one increment in the direction specified by the Direction line.The Enable line can be used (or ignored) to power or release the motor at the driver. Step: Pul+, Pulse, Clock, CLK, etc..
PMinMO is a standard pinout defined by Paul M from .mo for Step and Direction signals, as well as logic power and Enable. It uses a standard 2x5 box header with pins on 0.1" or 2.54mm centers. 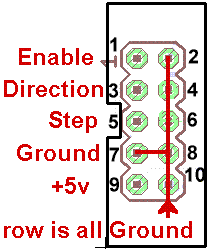 When used with IDC connectors on ribbon cable, the back row of grounds on the even pins provides alternating shielding for the signal pins on the odd numbered connectors. While not always named, this layout is often used in the connection between a motion controller and stepper or servo motor drivers. Pololu to PMinMO Adapter Cable converts the popular Pololu stepper driver header found on RAMPs or GRBL shields to PMinMO for use with larger motor drivers. BOB PID Servo Motor Control all accept PMinMO standard step/direction inputs. https://planet-cnc.com/hardware/#products-hardware Planet CNC USB and USB/Ethernet Motion Controllers are PMinMO compatible.